Far away from mass tourism. Quiet villages, no clubs and discos, no ongoing road, but unspoilt nature. 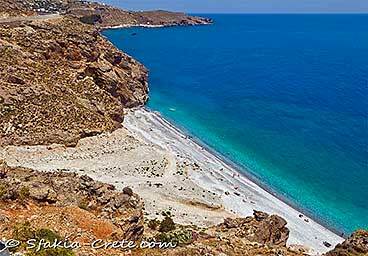 Small coves, and many secluded beaches with sweet water and small pebbles or sand. A clear blue sea, ideal for swimming, snorkeling and diving. Summer from May until into November. A walker's paradise, with many trails, gorges, mountain tops and plains. Good food and drinks in the tavernas, in excellent company. And very affordable. Although Crete every year now welcomes 3,5 million visitors, it is still possible to escape the crowds by heading south. Thanks to the high mountains that stretch from west to east across much of the island’s spine, southern Crete remains a place away from mass tourism. 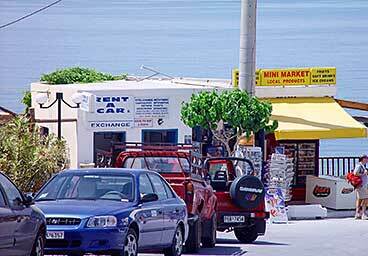 Known for their hospitality, traditional music and dance, and healthy cuisine, Cretans are also fiercely independent. They frequently rebelled under Venetian and then Ottoman occupation, with southern strongholds like Sfakia remaining virtually unconquered. As harsh as they were against their invaders, the more friendly they are to their guests. 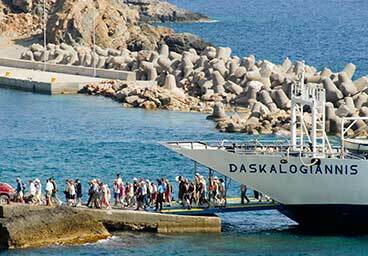 Due to the steep cliffs, overhanging the sea, the Sfakia area remains peacefully isolated. The coastal villages, like Frangokastello, Chora Sfakion, Loutro, Phoenix, Lykos, and Agia Roumeli, shimmering white with blue shuttered houses, and Sweetwater and Marmara beaches, are accessible by boat, but the adventurous can also hike there. The villages in the mountains, like Anopoli, Askyfou, Kallikratis and Imbros, can be visited on a walk, or by public bus, or hire car. Each village is a laidback base for several mountain hikes on the kalderimi, the traditional shepherd's paths, or a starting point for visiting the many gorges that cross the mountains from north to south. 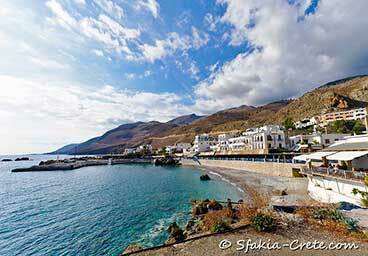 The most famous and impressive gorge of Sfakia and Crete is the Samaria Gorge, ending at sea in Agia Roumeli. If you are lucky, on occasions you will find yourself at a traditional celebration, to commemorate historical battles, or on the opening of a new business, or a baptism, or a massively attended wedding, at which 1000 guests are no exception. All feasts are accompanied by local food and drinks, and offer great live traditional music and dance; the songs, known as mantinades (15-syllable folk verses accompanied by the Cretan lyra, or violin), fully express the island’s powerful and wistful spirit. The Sfakian mountains are dotted with tiny traditional villages, fantastic spots to buy hearty local olive oil and thyme honey, and fresh herbs and spices picked from high up. 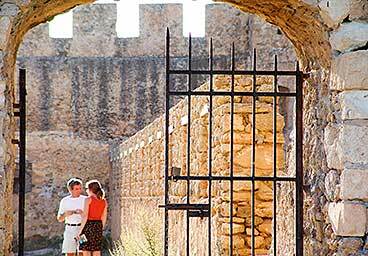 Several villages have an ancient fort, from the Venetian and Turkish era, and in Frangokastello, just above the sandy beach, is a large Venetian fortress from the 14th-century. And don't forget to visit the 90 metres high bridge, spanning the top of the Aradena gorge. 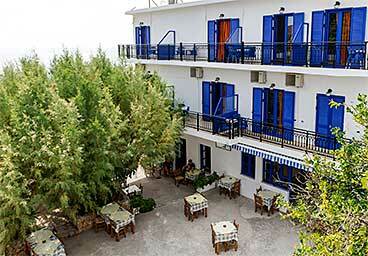 In the villages you will find several family-run hotels, tavernas and shops. The tavernas offer traditional Cretan food, all home-cooked, and the hotels offer clean rooms and studios, at affordable rates. 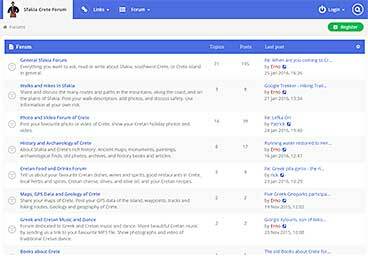 Crete is big enough to be its own country, and its people love distinguishing themselves from other Greeks. And the Sfakians love to distinguish themselves even more. 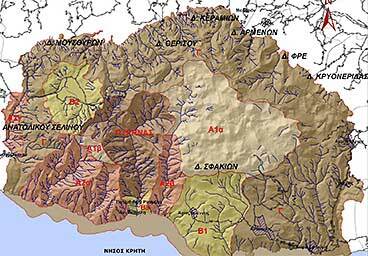 ...with an account of all the gifts God had given to other parts of Crete - olives to Ierapetra, Agios Vasilios and Selinou; wine to Malevisi and Kissamos; cherries to Mylopotamos and Amari. 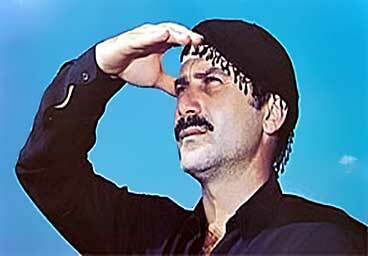 But when God got to Sfakia only rocks were left. So the Sfakiots appeared before Him armed to the teeth. "And us Lord, how are we going to live on these rocks?" and the Almighty, looking at them with sympathy, replied in their own dialect (naturally): "Haven't you got a scrap of brains in your head? Don't you see that the lowlanders are cultivating all these riches for you?" It is this sense of distinctness that makes the Cretans, with their indomitable Cretan spirit, and especially those from Sfakia, such good company. They can entertain with their jokes and banter, provoke with their stubbornness, seduce with their hospitality and amaze with their generosity. It goes without saying that being among them is rarely boring, and the laidback area is never sleepy. 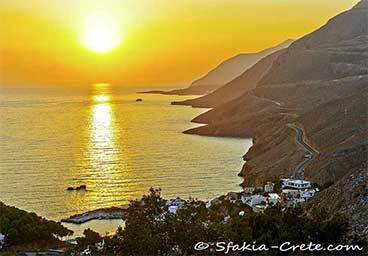 No wonder that so many visitors to Sfakia keep coming back, year after year.